Bataan Philippine - Mt. Tarak Ridge is "a Place Like no Other"
The Ayala Mountaineering Club Inc. (AMCI) and members of the local climbers in the province have discovered the rich potential of the historic Mt. Tarak Ridge as a tourist spot which they call a “place like no other,” and scene of one of the fiercest battles during World War II. “Standing at the peak of Mt. Tarak Ridge, it would seem you are in an airplane since you could see the whole view of Bataan, Manila Bay, and the tall buildings in Metro Manila. This place is unique in our country,” the mayor said in Filipino. 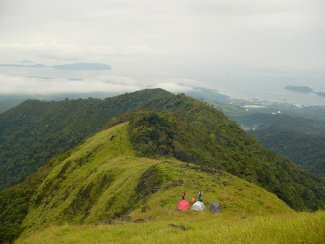 Businessman and mountain climber Dennis Cuarto, coordinator of Tarak Travel and Events, who recently led the mountain climbing all the way to the Tarak Ridge, said the place is like no other because of its virgin forest, cold environment, and unique site. Cuarto said he is planning to have a “1st Tarak Peak” trade fair in April to promote the potential of the highest mountain in the province. A joint team of American and Japanese conducted an expedition led by American national Spike Nasmyth and recently found the wreckage of a World War II Japanese bomber plane and the skeletal remains of its pilot who engaged in a historic dogfight with an American aviator during World War II along the forested area here. The discovery of the Japanese bomber and its pilot grabbed headlines in national newspapers and rekindled the World War II events in which Bataan was the site of one of the fiercest battles between the Japanese and the Filipino-American forces at the height of the war. The remains of Sgt. Toshishada Kurusawa, pilot of the Tora-Tora plane, have been turned over to the relatives of the Japanese pilot who came here from Japan for the nostalgic occasion.